Taken from Erle's Instructor classes in Llangadog Wales. This volume and the next volume 13 include the following. From Erle: These classes are to teach about reflexive self defence. We do not learn about sparring or even fighting, just real self defence from a sub-conscious level. Sparring in fact is the worst thing that one can do if you wish to learn about self defence as it causes you to learn about sparring! And "Sparring" does not happen in the street, nor does tournament "fighting". Sure, if you wish to do a sport then do your tournament sparring but do not expect it to save you in a real fight! In fact, many have discovered that it is almost impossible to learn real self defence methods when they have learned and practiced tournament sparring for many years or even become World Champions etc. First real fight in the street and they go down. This is because they have never worked upon reflexive actions, they have in fact tried to use their kata as self defence! And Kata or Form are NOT for self defence, they were only ever meant to teach us how to move, well "Form" was for that as most karate schools teach that kata is for fighting! So from now onward, this is where we take what we have already learnt in these classes and put it into the real world. The punching mitts and shields are now replaced by your body! We will be doing what we in the internal call; "attack/defence". This is where one person will gear up in protective stuff and try to knock his partner's head off! And his partner has to react reflexively and register a solid and telling blow onto the attacker's body. Of course, this will move along very slowly as another damaging area for real self defence is going into it too soon or simply having to fight someone when you aren't ready. So do not worry, we will be taking it very slowly and those who perhaps aren't up to it yet, we will be gentle! 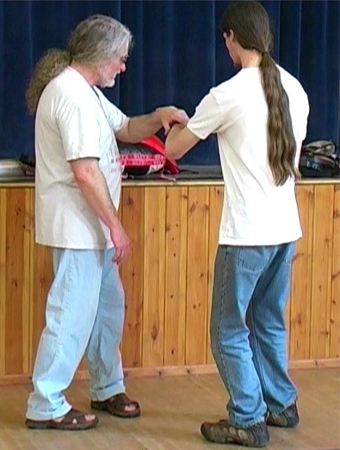 I will also be covering push hands, da-lu and ch'i-na along with stick fighting on a more basic "bang 'em up" level as we have now finished the twelve Wudang stick fighting methods forms. Our multiple kill and single kill methods have now become a little more sophisticated in that we have other things to do other than just bashing the shyte out of the opponent! We still do that, but also take into account that other things might happen and we have to be aware of these. So these are incorporated into the training. We will also continue with the developing of the "Fa-Jing Muscle" training in order to train the group of muscles particularly involved in issuing fa-jing or explosive energy. Xingyi also gets a look in with the next of the drills covering the fire elements both yin and yang drills.